This electrifying Portuguese progressive-jazz trio pulls a lot of tricks out of its magic bag, but alleviates the flow a tad with its solicitous rendition of Black Sabbath’s “Planet Caravan.” Here, tubaist Sergio Carolino and guitarist Mario Delgado venture towards a metal-lite jazz aura, fused with a resonating jazz-blues-rock mix, culminating in a fuzzed-toned finale, as the soloists’ generate stepladder-like crescendos and melodic interpretations of the primary theme. 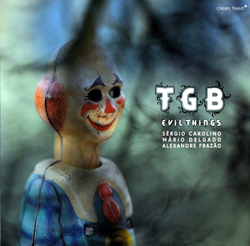 Delgado and Carolino toss a few nicely devised curve balls into this piece by morphing an avant jazz and rock-tinged improvisational segment. It’s a clever reworking of the original, abetted by the trio’s inauspicious and breezy opening, which leads to a dynamic opus, spiced with a translucent convergence of disparate genres. At times charming, yet irrefutably witty and powerful, this cover tune nicely augments an album that is loaded with keenly executed surprises.